An old ship. A sad friend. A button . . . An idea. Let’s SWAP! Steve Light is the author-illustrator of The Christmas Giant, Zephyr Takes Flight, Have You Seen My Dragon?, and Have You Seen My Monster? He lives in New York City. Light's artwork is lightly amusing throughout, with a throng of crabbed ink lines busily filling the mostly white backgrounds, making the incidents of color—blue here, purple and orange there—the more sparkling. Complementing the smart artwork is a smart story: you don't have to have a pocket full of gold to get by; wits often work just as well. Though the boy's peg leg immediately conjures hoary old pirate tropes, these are honest, hard-working tars, and it's a positive delight to see a disabled boy depicted as an equal participant in the economy. Though the story is told through very little text, the mathematics inherent to each exchange extends to older readers. If they trade four of their six oars, how many should be left? These questions are not explicitly asked, but the illustrations always bear out the answers. The result is a delightful adventure with a sweet underlying message, and the treasure maps that grace the end papers are a perfect final touch. As he did in Have You Seen My Dragon? (2014) and Have You Seen My Monster? 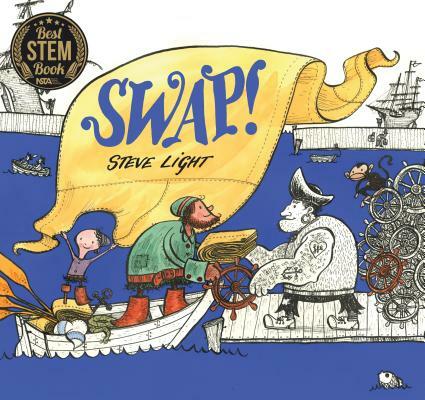 (2015, both Candlewick), Light brings his exceptional talent and clever storytelling to young pirate lovers and fans of all things nautical...Several pages of sequential panels assist the minimal text in telling this engaging story of ingenuity and resilience. A fun-filled swapfest for salty dogs and landlubbers alike. The boy’s wooden leg is a physical difference that isn’t remarked upon and doesn’t hinder him from doing what he likes, and the fact that it’s the boy who comes up with the plan is satisfying, too. Light’s story will leave readers with much to think about. The limited, repetitive text will be a boon to beginning readers, and the unusual deployment of limited swaths of matte color to accent the sea, the protagonists, and their trades will invite older viewers to consider how color guides the eye across a spread. Faintly reminiscent in its cheerful preposterousness to Bob Gill’s “A Balloon for a Blunderbuss” (1961), Mr. Light’s tale features airy pen-and-ink illustrations that are brightly pigmented in only a few places—so readers ages 4-8 may want to keep the book away from their younger siblings, lest they be tempted to color in it.